The Hotel Paris , a 2-star family-run hotel in Cattolica, offers secure parking for all guests, free bicycles and free Wi-Fi throughout the entire hotel. Admitted animals of small and medium size. 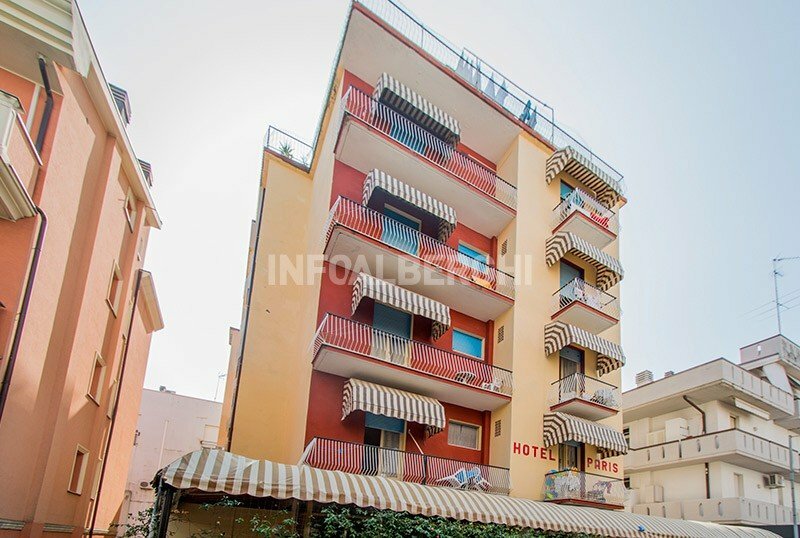 The hotel is located in Cattolica, in a quiet area and close to the pedestrian promenade of Viale Dante. The beach is a 3-minute walk away and the Cattolica Aquarium is less than 10 minutes away. The rooms have a balcony, private bathroom with shower or box, minibar, safe, ceiling fan, TV, WI-FI and complimentary toiletries. Hairdryer on request at the reception. Five rooms have a sea view. Possibility of breakfast in self-service room. Garden with tables, open-air porch, free bikes, air-conditioned dining room, elevator, reception with valuables, free shuttle service to the airport and station, free access to the gym and tennis court of the Grand Pascià Hotel. Organize party evenings at the disco of the nearby Hotel Baia Marina. PARKING: covered and free (all inclusive) to 300 m with shuttle service. AIR CONDITIONING: present in common areas. BREAKFAST: sweet and savory buffet with jams, homemade desserts, yogurt, cold cuts, eggs and cheeses. LUNCH AND DINNER: Romagna and vegetarian cuisine, with homemade pasta and desserts. At lunch and dinner you can choose between 3 menus with meat and fish dishes, followed by sweets and seasonal fruit. At meals: baby food , high chairs, baby menu agreed with parents. Vegetable broths and vegetable soups available for payment. The hotel has an agreement with the beach n. 85, copn mini club, playground, baby sitter, pedal boat.